Kids are smarter than you think. They’re tougher and more adaptable than you assume. The secret’s out here in Southeast Asia, though. These parents know this hidden fact: kids know quite a bit of how to take care of themselves. I’ve been in Asia for more than four months and a big takeaway is how much American parents baby their kids. Children in the U.S. live sheltered, cushy lives. Parents don’t let their children play in the front yard unsupervised. They won’t let them run barefoot in the park. Kids aren’t allowed to walk a few blocks alone to their neighbor’s house to play. Parents believe the world is dangerous and that kids can’t be trusted to take care of themselves. Here, though, things are different. Here, you’re surrounded by evidence that children are capable. That they’re not helpless, death-seeking bundles of flesh. Today I saw ample evidence to support this hypothesis. 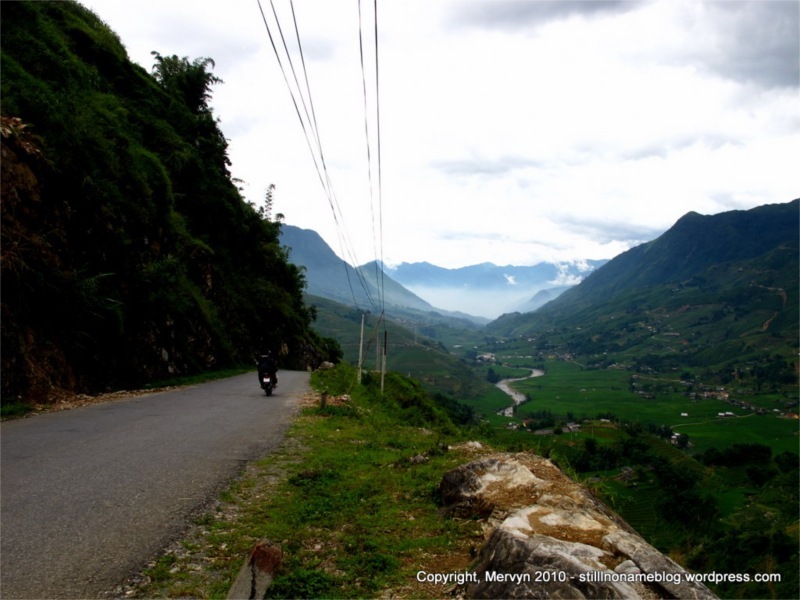 I continued my interrupted-by-illness mini-motorbike tour of the hills around Sapa. Thanks to a Cipro I’d snaked off April a few weeks back, I was feeling much better. I opted to head south and retrace a portion of my first day trek. This time, though, I did it on roads and went even further into the valley. 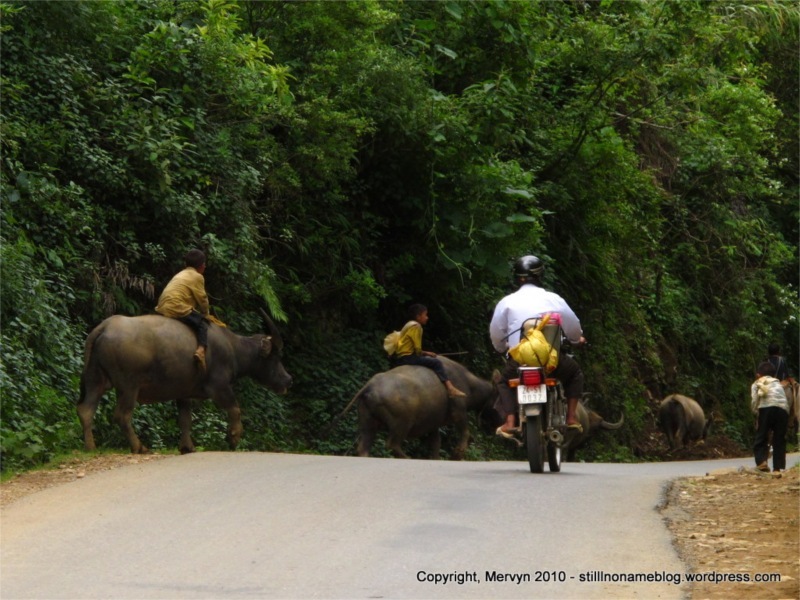 On the way down to the base of the river, I saw two boys riding on the backs of water buffalo as they walked up the winding hill road with their herd. The boys were laughing and yelling at each other, turning what seemed like work into a game. These roads are narrow. If you happen to step wrong, you might get killed by wheeled, metal death. Tour buses hurtled down this road ferrying tourists up and down the valley. Those same tour buses passed those boys and their herd. Somehow, though, the kids were not getting killed. Did I mention they were barefoot? All day I saw kids not dying. A group of unsupervised children scampering down the side of the road, running to and from wherever it is they play. 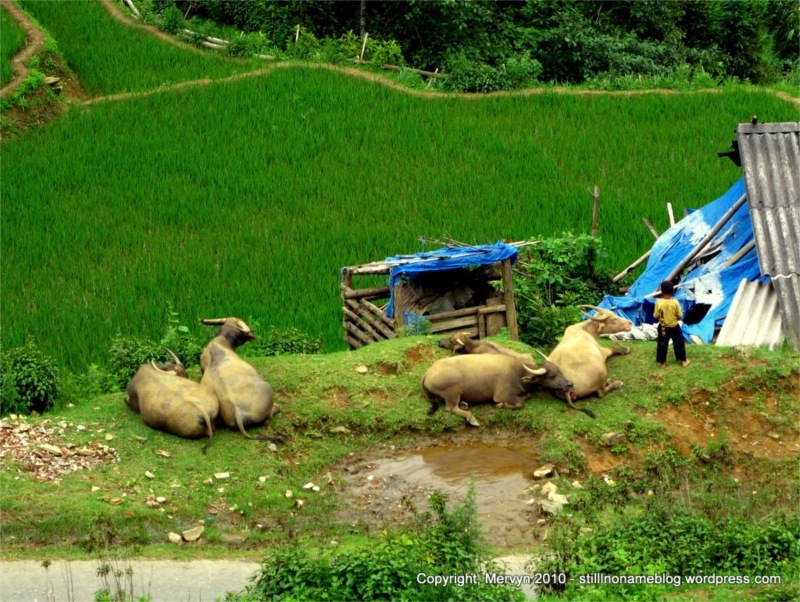 A knife wielding boy tending to a herd of water buffalo by a roadside watering hole. A child sitting on the back of a motorbike, the only thing keeping him on: his arms wrapped around his father’s waist. 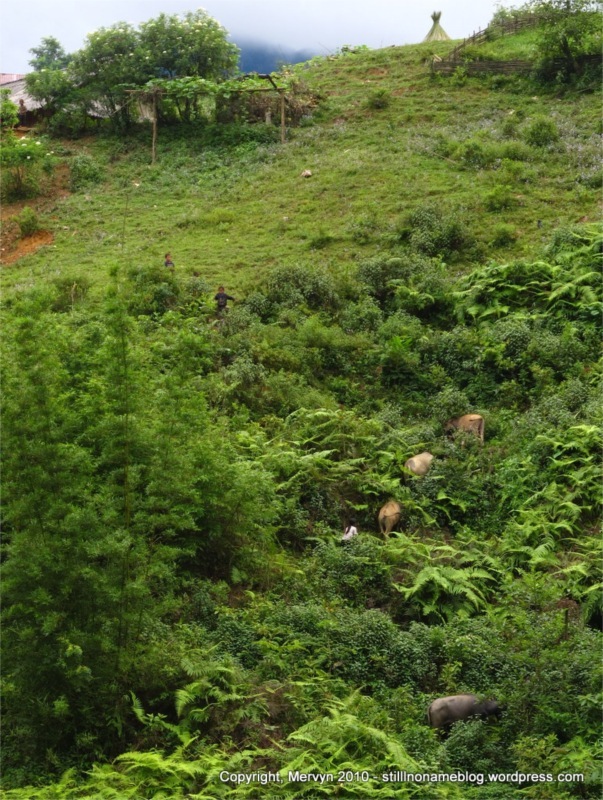 A band of children playing amongst a herd of water buffalo grazing on a steep, jungle-covered hillside. Kids swimming in the river, not an adult in sight. All these kids were in situations that, in the United States, might be considered child neglect (or even abuse). In each circumstance, the kids were fine. They were taking care of themselves. Now, it could be that all these kids’ parents let them run around because they couldn’t care less about what happens to their children. Or, perhaps they’re savages that don’t know better. Nope. In Vietnam, parents dote on their children. It’s common to see a group of adults crowded around a child, playing, smiling, laughing, and providing all kinds of attention. It’s not just the ladies, either. Men, young and old, react to children like Western women do to a kid in a stroller. They embarrass themselves. On the trip from Nanning to Hanoi, one of the moments where I really felt like I was in Vietnam was on the golf cart ride from Vietnamese immigration control to the bus station. While waiting for the supersized golf cart to fill, a group of young men teased and played with a two-year-old that was already onboard. They poked at him and tried to get him to laugh. They went baby voice. They ran around the cart trying to get the kid to pay attention to them. This wasn’t their relative or someone they knew. It was just some stranger kid. You see stuff like this all the time in this country. Men unabashedly going gaga over a child. People here love kids. 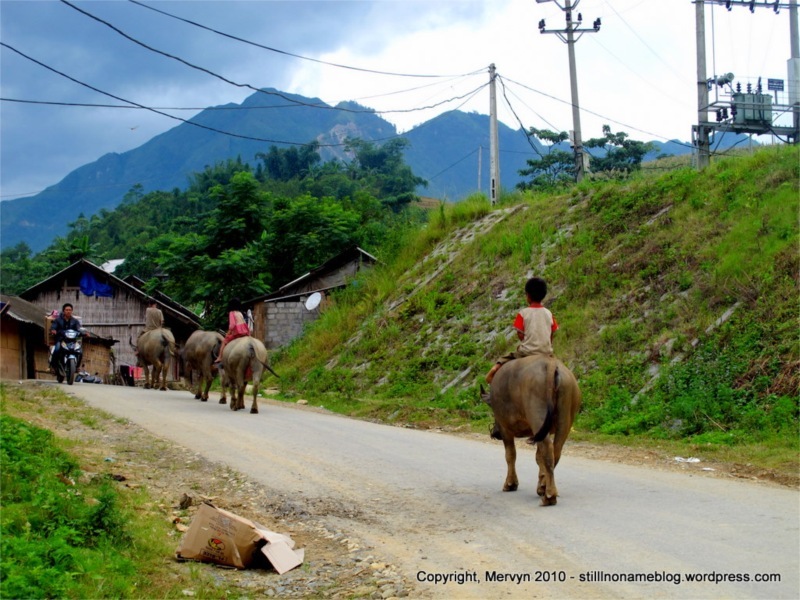 All this adoration makes it hard for me to believe that parents are willfully neglecting their children by letting them run around the Sapa valley all by their lonesome. I think parents here believe that their kids know how not to die. Now, I realize that America is very different from Asia. Perhaps the world of the West is more dangerous and unforgiving to children. I doubt it. 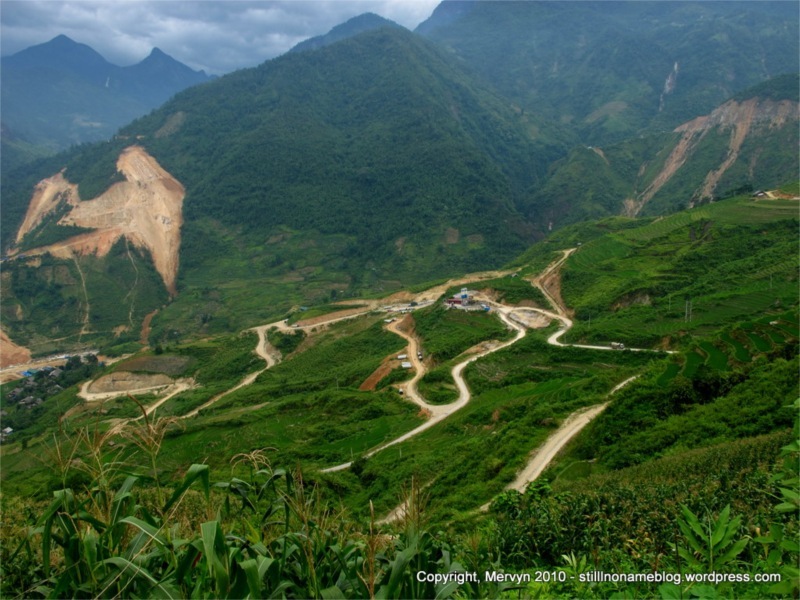 To accept that would be to assume that a jungle hillside or a mountain road is less dangerous than a suburban front yard. That doesn’t pass the smell test. I really do think that kids are much more capable and resilient than most American parents give them credit for. To that end, if I am ever saddled with kids of my own I plan on letting them put dirt in their mouths. I want them to wade around in the mud. I’m going to let them fall down and learn to get up on their own. I want them to be able to take care of themselves. I want them to be able to play unsupervised, wandering the American equivalent of jungle hillsides. 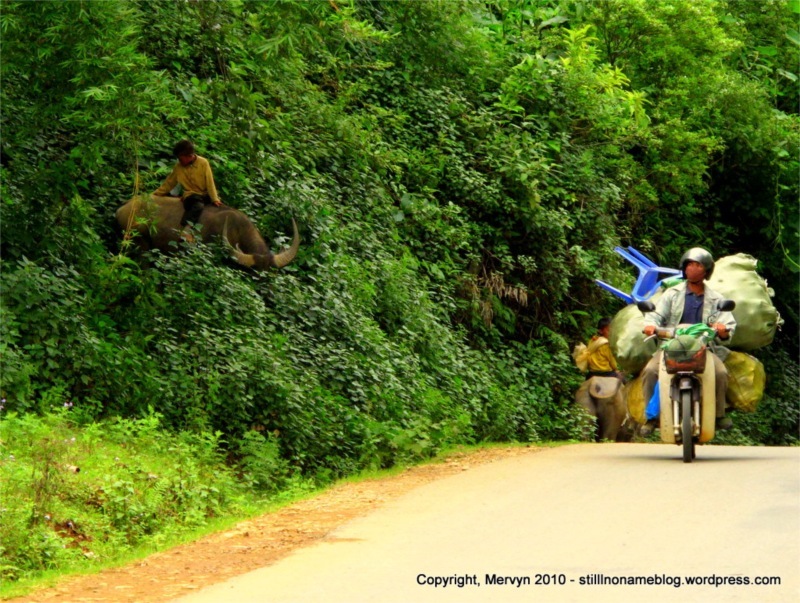 I will let them ride the water buffalo down a dusty mountain road. 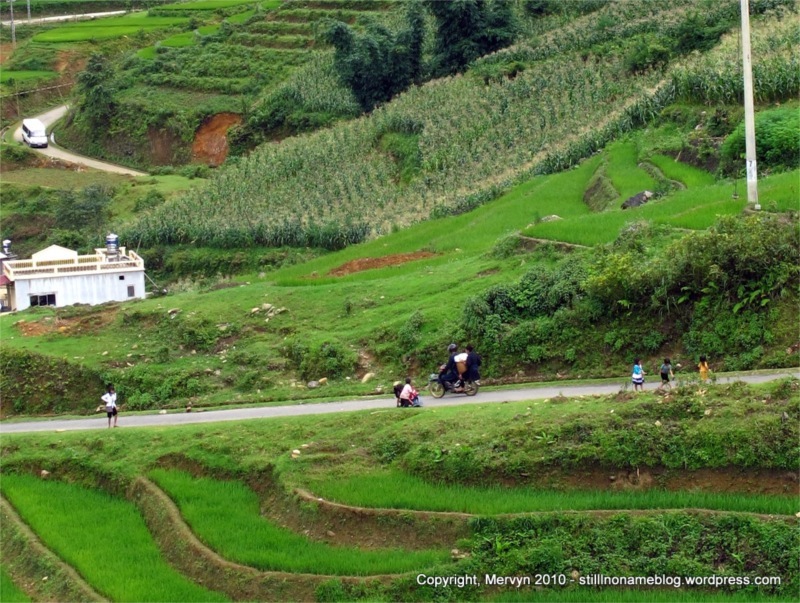 GALLERY: Click through to see more pictures of kids not dying, people tending to fields, and more pictures of the roads Mervyn traveled on his thin-wheeled, stiff-suspensioned motorbike. Good for you and your parenting aspirations. 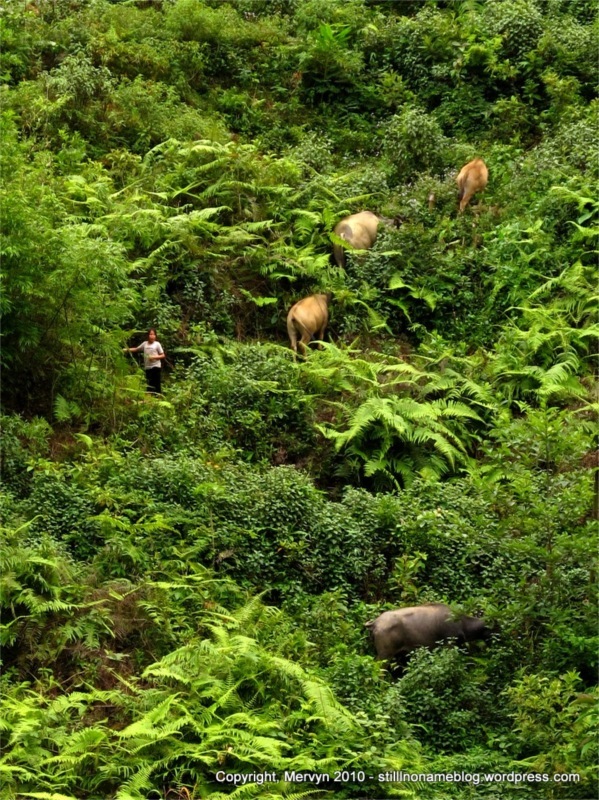 We’re trying to do that kind of thing (sans water buffalo) and it’s really hard to find like-minded parents. I think it’s probably hard to find like-minded parents because most parents think things like eating dirt is -insane-. If kids are kept hermetically sealed, they’ll never develop the hearty immune system necessary to survive the apocalypse. Took a look at Free Range Kids and I’m impressed. I’d consider submitting my piece except (1) I don’t have kids so can be easily dismissed and (2) I fear a passing reference to putting kids in a “dead pool” might deem me inappropriate for the site’s audience. Oh well. Love the site’s sentiments, regardless. You may find this Forbes article on the Consumer Product Safety Commission interesting. It ranges beyond kid products, but it does highlight the insanity surrounding attempts to create a riskless world. I wonder if this difference is mostly caused by western parents having fewer children. If you only have 1-2 kids then not only is your evolutionary success more “at-risk” but then it’s also much easier to micromanage those 1-2 kids versus 4+ kids. Perhaps these parents are heavy gamblers addicted to the delights of a good wager. I’m not sure if that’s it. 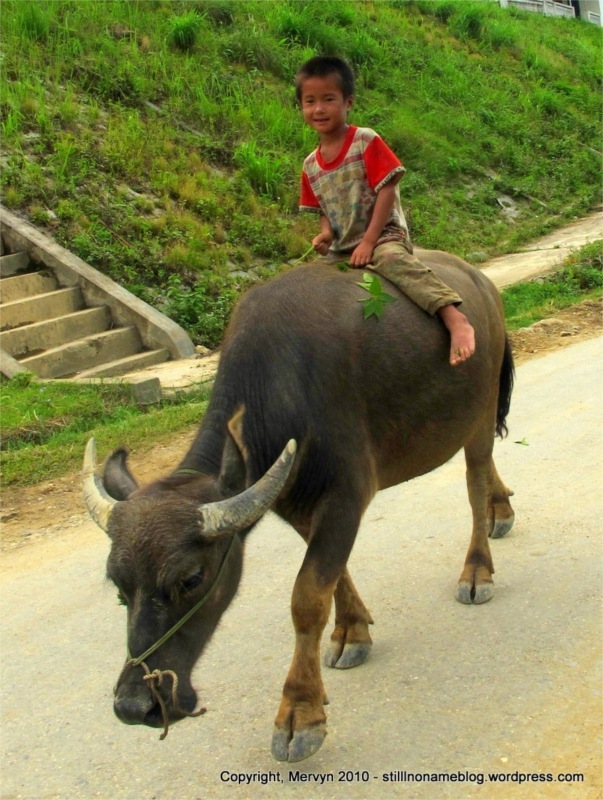 Perhaps in Sapa are letting their kids run around because they have to work in the fields and can’t keep an eye on them. I have seen, however, parents walking with one child along the side of the road. The kid is no more than 3 years old, but the parent isn’t holding their hand or forcing them to the side of the road. They figure the kids has, by that age, figured out that running into the street means death. There, there’s every opportunity to micromange, but the parent doesn’t do it.